There is a fascinating video on the Nature website about the Antikythera Mechanism (link to Nature letter). Here's another video on the topic. Yesterday I went into London and had a go at some geocaching. By the end of the day I must have walked some 18km (when I finished caching I turned off the GPS, but still had some walking to do). I got 13 geocaches, with a couple of 'did not finds'. That brings me up to 65 caches overall. Caching in London is a whole new thing, a lot of the caches have to be really well hidden so they're not discovered by people not hunting for them - there are some really ingenious hiding spots (e.g. one of the main bridges near Waterloo station has a cache right in the centre of it (the centre of river, not the centre of road). A few times I thought 'If anyone sees me, I'm going to get reported as a KGB agent!' - as to find a cache involved retrieving a hidden item, writing something in it, and then rehiding the item. This is something like a 'dead letter drop'. On my rounds, I popped into the Novello theatre to get tickets to see 'Footloose', and also the Royal Opera House - we're off to see the Bolshoi ballet. Add to this Avenue Q, which I'm really excited about, Stomp and Guilfest - it'll be a packed summer. When I finished caching, I met up with Monica at the British Museum, I'm a friend of the museum and so it didn't cost us anything extra to get into the Michelangelo exhibition, the exhibition will remain until the 25th June. Before I sign off, here are some Avenue Q links, the music used in these links is a song from the show. The Avenue Q soundtrack, and other goodies, are available in the UK from Amazon. It is 20 years ago today that the Space Shuttle Challenger exploded. I well remember this, it was a huge event. I saw it on television, and could not believe it. The explosion, then those two rockets flying off in seperate directions. The great physicist, Richard Feynman (who should be as well known as Einstein) was on the investigating board of the Challenger disaster - famously (amongst folks who know about this sort of thing) demonstrating before the press how the 'O rings' which sealed the fuel tanks could fail. It did graphically demonstrate that space flight whilst routine, was not risk free, despite the low risks stated prior to the accident by NASA management (contrary to the estimates of the engineers). For me, Challenger was one of those defining moments as I grew up (along with Chernobyl in the same year). This was why I watched the landing of Discovery after a troubled flight with baited breath. I literally held my breath as the infra red showed the shuttle circling, and did not realise this for some time... not good! Today, in 1942, the House of Commons condemned the massacre of Jews by Germany. This is news to me, I wasn't aware that that the holocaust was public knowledge until the end of the war. I wonder how much of this percolated through to the 'man on the street'? Even hearing about it, I doubt if anyone at the time could truly imagine the scale of things. The statement condemned "in the strongest possible terms this bestial policy of cold-blooded extermination" and made a "solemn resolution to ensure that those responsible for these crimes shall not escape retribution". Unless I'm missing the information, It is not clear from the linked story if the allies were aware of the treatment of the handicapped and the gypsies. Today is the 400th anniversary of the plotto blow up parliament. The plot involved Thomas Bates, Guy Fawkes, Robert Wintour, Christopher Wright, John Wright, Thomas Percy, Robert Catesby and Thomas Wintour. This would have been one of the biggest terrorist acts in history, as the building would have been destroyed taking a large chunk of London with it, the government and the monarchy. This is as parliament was prorogued until the 5th November, and on that day the monarch would be in attendance. Guy Fawkes was the guy in charge of the explosives in the Gunpowder plot, he is the person most well known as he was discovered beneath parliament and tortured before being hung, drawn and quartered. The plotters sought to redress the persecution of Catholics which was being present in 16th and 17th Century England. Though the 26th of June was the anniversary of the signing of the UN charter, the 24th October is the anniversary of it's coming into being, when the majority of signatories ratified the charter. Happy (official) Birthday, United Nations. Today is the 15th Anniversary of Saddam Hussein appearing on Television with his 'Human Shield' of hostages. This is one of those events that make one realise that time is moving on. That only seemed like yesterday. At the time I was mid A-Levels, and taking part in a summer job for Kent County Council. I had the task of visiting council properties, including schools and offices, to fit curtains and carpets. I think that week I spent working in a theatre, dealing which huge stage curtains - and at the time being terrified of what might happen next. There was talk amongst my peers of a draft! I well remember seeing that boy being patted on the head by Hussein. A book arrived in the post today, it is entitled Matricule 42132, Stalag IIIB, written by Maurice Buisson. The reason I've been sent a copy is that the author saw this post. He wanted to use the image of the camp money, and promised to send a copy of the published book. In my recent LXR122 course, we had to talk about France, be it French History, Culture or Today in France. For my topic I discussed how my Grandad was captured at Arras on his way to Dunkerque, so this book is well timed for me. The note can be seen on page 40 of the book. I just wanted to share another of my photos from the British Museum. This is Parvati, the consort of Shiva. This is a Hindu artifact. 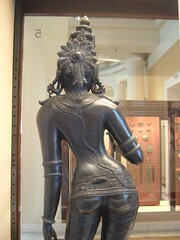 She is standing in the classic tribhanga pose, where the body is bent in three directions. 60 years ago today, the first atomic bomb to be used in anger upon living people was dropped. This was, of course, Hiroshima in Japan. The bomb was developed at Los Alamos laboratories in the US, and had the destructive power of 20000 tonnes of TNT - by today's standards this is a small bomb. As the bomb was developed, its builders were aware that the Germans may be working in the same field. Combined with the V2 this would have been disasterous. Even after Germany was defeated, one can make the case that not dropping the bomb would ultimately have cost many more lives on both sides of the conflict. The 'Little Boy' was dropped by the Enola Gay. Today is the 15th Anniversary of the day when Iraq invaded Kuwait. A few days later, a British man was shot by the Iraqis as he tried to leave Kuwait. Some three weeks later, western hostages were shown on Iraqi TV as 'Human Shields', they were freed in December. This sequence of events ultimately gave rise to the first 'Gulf War', operation Desert Storm was launched in January 1991. No, not the computer animated story, but the Battle of Trafalgar. The re-enactment of Trafalgar gets underway, with the Red and Blue teams (so as not to upset the French). This is a crazy idea. The powers-that-be are making themselves out to look incredibly stupid. It's quite amusing that this is from a nation that when deciding where in London to build the eurostar terminal, which is the terminal for passengers arriving from France, decided to place that terminal at Waterloo Station. The rationale must be that the name "Waterloo" could have no possible significance to the French, unlike Trafalgar. Here's a secret. The French are the blue team. The blue team lose. This is moronic over-sensitivity on the part of the British. The Battle of Trafalgar was 200 years ago, and in the past 100 years then Britain and France have been allies, albeit with some gentle leg-pulling. 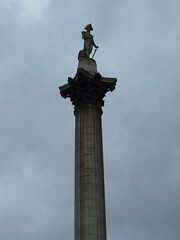 Either we commemorate Trafalgar, or we don't. I think that we may have opted for the latter. Today is the 60th Anniversary of the UN charter. This was signed by 50 nations in 1945, and for all its flaws it has been a major achievement. Happy Birthday, UN. Fifteen years ago today, the then Chancellor, John Major, proposed a new European currency. This was dubbed the 'Hard Ecu'. The name, ECU, stood for 'European Currency Unit' and was a damned silly name - but one which held for a while as to call it 'Pound, Shilling, Dollar, Franc' or some other name would likely cause turf wars over the name rather than the principle. The Prime Minister, Margaret Thatcher, said that currency union was unlikely in her lifetime. The Euro entered circulation in 2002, having been traded for several years as a seperate currency. Ironically, despite the involvement of the British in 1990, the UK is one of three EU countries which did not sign up for the Euro. This is a very old family photo. Centre top is Robert Swan, my great grandad. My mother says he was called 'the hunchback' as he had some sort of growth problem which affected his spine. 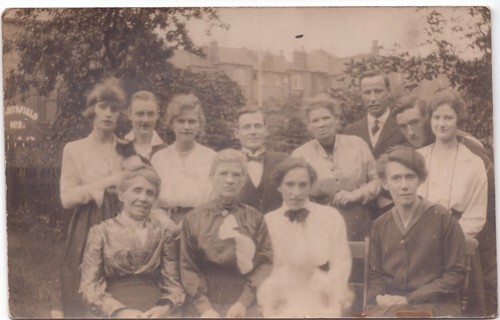 In the front row with the white shirt is my great grandmother. This was a photo which was taken during World War 2 inside a German POW camp. This shows a the people involved in a Prisoners' Performance. 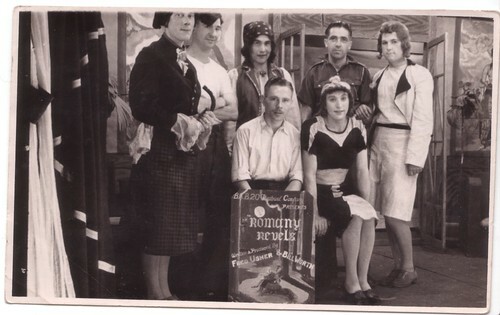 I'm told that the man in the white shirt behind the sign is my Grandad, though I can't see it myself. Grandad used to be involved with the makeup for the PoW shows. Today is Remembrance Day. A few moments silence, please. It was 15 years ago today that the Berlin Wall fell. For months, the eastern block countries had eased travel restrictions, and hungary was taking in many east german refugees. On the 4th November, 1989, a pro democracy rally forced the resignation of the East German government. On the 9th thousands turned up at the Berlin Wall demanding to be allowed to pass. The border guards stood back as people flooded through, and people began to pull the wall down in celebration. In less than a year, Germany was reunited. I well remember these momentous events. At the time I had just started my A Levels, and amongst ourselves there was uncertainty about what would happen - we had a fear that the troops would start shooting, only ever having known the 'Iron Curtain'. Fortunately we were wrong, and it's one of my regrets that I didn't just jump on a plane and get myself over there. I was probably too young though, 16 going on 17. Guy fawkes was captured attempting to blow up the houses of parliament 400 years and 1 day ago, on the evening 4th November 1605. This came to light on the 5th, and this is why we now celebrate Guy Fawkes on the 5th November. He was executed on the 31st January, 1606.